1. If you want to have your cinnamon rolls ready to eat by the first session (which is now at NOON for me, are you jealous? ), then you should probably not volunteer to help with the preschool rummage sale from 7:45 am until 11:00 am. No, you will not miss any of conference, but you will also be eating cinnamon rolls for dinner. Or dessert. 2. Keep the frosting bowl out of the reach of the resident three year old. Otherwise, you will come into the kitchen and find the bowl on the floor, several spoons and spatulas covered in icing and cute little tongue marks, and no frosting for the second batch. It's a good thing Joel insisted on buying extra cream cheese. You know, just in case. 3. Fruit flies really, really, really like yeast. Even if you honestly thought that your house was finally rid of the fruit flies you brought home from the grocery store your first week here and learned that you cannot have a fruit bowl. Ever since you started storing the fruit in the fridge, the flies have been few and far between. But boy, as soon as you set the yeast out, they come to visit in droves. Ick. 4. This frosting recipe really is The Last Cream Cheese Frosting Recipe You'll Ever Need. No wonder Sophia needed to eat the entire bowl. 5. No matter how well-intentioned you are, you will not give any of them away to your neighbors. 6. Except the missionaries. And boy, are the elders ever excited to receive a plate of cinnamon rolls. Besides, giving some to them makes you a part of the Marvelous Work. Missionaries can't be effective without good food, and nobody can be expected to survive Conference weekend without homemade cinnamon rolls. Really. 7. Even if you think you can resist, you will end up eating more than one. Okay, more than two. 8. Fine. More than five. Are you happy now? 9. Because you ate so many, you are seriously considering a family-wide sugar detox. (Actually, I'm not even kidding about this.) Somehow, listening to the inspired words of the prophet and the apostles made you realize that you need to stop rewarding your kids with food right now, and start rewarding them with things of a healthier nature. I don't know what yet, but I'm working on it. I'll keep you posted. 10. Regardless, the sugar-fat-filled goodness that are your homemade cinnamon rolls (which you only make twice a year for General Conference anyway), will cause your children to bestow upon you the title of Best Mother in the Universe and your husband to proclaim you a goddess. Anything with that kind of power is totally worth it. PS Here's my General Conference Cinnamon Roll recipe. #8 is the reason I don't make cinnamon rolls more than 2 times a year either! And sometimes I don't make them more than 2 times in 5 years. I make plenty of other junk though, so don't be impressed. I love cinnamon rolls at conference. But boy am I ever grateful for Rhodes bake and serve. And I am jealous that your first session starts there at Noon! You are killing me here! I need cinammon rolls! Conference here starts at 8am. Call me strange, but I love it. I have never made cinnamon rolls from scratch, can you believe that? 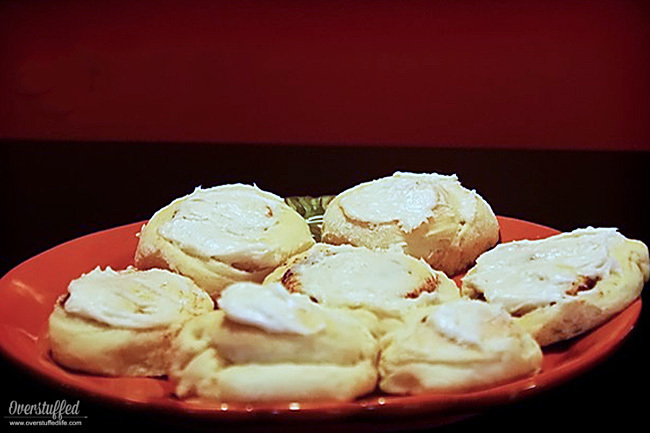 I make all sorts of foods from scratch, and I have never attempted cinnamon rolls. A birthday is coming up, I am going to have to try your recipe. They sound delicious! Advice, next time, don't leave the hubby in charge. If he were mine, I would have sneaking suspicions he headed the "eat the frosting" campaign. But that is just my hubby. I'm not a fan of cinnamon rolls-except for my mom's. She makes them only for conference and I can't get enough! Yum. Traditions, that is what strong families are made from. I dind't bake anything for conference, but last night we put up Halloween decorations together. You should see the light of excitement go on in all of our children's eyes. especially the baby's for the first time. Yep, what wonderful traditions! There'll be great memories of conference and cinnamon rolls for years to come!-Amanda B. If you figure out the sugar detox, please pass it along. I think we need to do the same. I had a frightening revelation the other day. It was particularly stressful and I craved sugar all day. Finally went and got my fix, and I felt better....then it hit me....holy cow sobering moment. I.Love.Cinnamon.Rolls. Love them. I wish I were at your house for Conference!! YUM! Lael asked to do something fun so maybe I'll whip those up for her. Mmm. We had homemade cinnamon rolls for Conference Sunday too. I'll have to give your recipe a try. Around here we just eat gobs and gobs of candy and a picnic lunch on a blanket (all King Benjamin style). It's good time, but we're in sugar detox too. All the Mormons make cinnamon rolls on conference weekend. YUM~ And thank you for sharing the recipe. Nothing is worse than reading someone's delicious sounding blog and they don't share! I made Cinnamon rolls last conference & Sticky pecan pull-aparts/Monkey Bread this year. They were really yummy. My neighbor gave me a fruit fly tip the other day. Put out a 1/2 cup of apple cider vinegar with a squeeze of dish soap. Cleared up the problem I had overnight (aren't fruit flies the nastiest little pests?!). I didn't measure when I tried it, and probably had at least twice as much dish soap as necessary, but it worked! YUM. yum, yum YUM! We had french bread casserole again this time (first tried it in April - also YUM). But my hubby loves cinnamon rolls with a passion, so I could see myself making these more often! Mouth is watering ... thanks for the recipes ... have already bookmarked them!!! And reason #6 is my main desire to adventure out of Utah ... I want to feed missionaries!!! (I was one once, they have a huge spot in my heart). Hmmmm - now, about all the candy I fed my kids during conference ... hmmmmm! I loved this! What a great conference tradition. Can i come to your house? And I can't resist adding that all this luxuriating in sticky, sugary cinnamon-roll goodness totally reminds me of Susan Tanner's talk a few years back, when her mother ate too many cinnamon rolls? Haha. Mmmmm. . .cinnamon rolls! Made them here too. What a fun tradition! You inspired me to make sugar cookies!Thanks you rock! I love cream cheese icing. I must bookmark that recipe immediately.